(CNS): With increasing complaints that local people simply cannot find work, despite there being more than 20,000 work-permits held by employers for foreign staff, the National Workforce Development Agency has begun an outreach programme. Facing considerable criticisms from people who use the for job placement unit, government is attempting to make the department fit for purpose and NWDA officials said the outreach was part of its goal to improve customer service to its clients in their job seeking efforts. An NWDA representative will now be stationed at district libraries on a monthly basis to help job seekers. The agent will provide opportunities to register online with the NWDA, to search the online job portal and self-referring for jobs, assist with preparing resumes (CVs) and preparing for an interview. For the first week of each month the NWDA representative will be at East End Library Branch on Mondays 10am to 1pm, then Bodden Town Library on Wednesdays 2pm to 5pm, but as a result of Ash Wednesday this will be moved to 19 March for this month. In the second week of the month the agent will be at North Side Library on Monday 10am to 1pm and then West Bay Library on Wednesday 10am to 1pm. For more information contact Dianne Connolly, Manager Training & Development dianne.conolly@gov.ky. (CNS): Sports health experts from the United States (US) were in Cayman this weekend checking experts the heart health of elite local athletes aged 15-19 at a specialist clinic hosted by the sports ministry. Athletes who already represent the Cayman Islands internationally in football, swimming, cricket, netball, basketball and athletics, or who are eligible to do so, took part in the second annual Athletic Heart Clinic Saturday co-sponsored by Cayman Heart Fund where a team from St Luke’s Mid America Heart Institute screened their heart health with the goal of identifying and then treating any potential problem before it becomes a serious problem. During last year’s Athletic Heart Clinic doctors tested 63 young athletes and found six with abnormalities, of which two were potentially life threatening. Both young athletes underwent medical intervention at St Luke’s, and have since resumed training and competing. The annual Athletic Heart Clinic is part of the Cayman Islands’ community’s response to the death of young footballer Gerome Graham less than two years ago, from an undiagnosed heart enlargement. Once again the clinic took place at the Health Centre in West Shore Plaza on West Bay Road to assess the athlete’s r risk for sudden cardiac arrest (SCA).The cardiologist conducted the evaluation which included a comprehensive cardio-vascular history and physical examination, an electrocardiogram and a 2D echocardiogram. Staff of the Heart Health Centre provided additional support. (CNS): Kemar Hyman will be representing the Cayman Islands in the men's 60m event at the 15th IAAF World Indoor Championships against some of the fastest runners in the world. 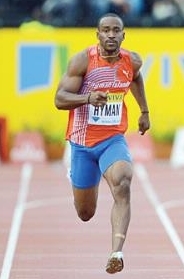 Hyman will compete as the sole representative of the Cayman Islands at the games which will be held in Sopot, Poland from Friday 7 thru Monday 10 March 2014. The first round of the men's 60m is scheduled for 10:35am Cayman time (18:35 Europe time) on the Friday, followed by the semi-final round at 10:30am Cayman time (or 18:30 Europe time) on Saturday 8 March and the final at 1:00pm local time (21:00 in Poland). “I am excited to represent Cayman at this prestigious event, I will be running against some of the best in the world” said Kemar Hyman. The local runner has been training in Birmingham and recently posted a time of 6.71 to take 6th place in his heat at an indoor event in February. (CISC):Unusually calm conditions saw six boats on the start line for the annual 12 Mile Banks and Back race to produce some very exciting racing and close finishes.The light easterly winds saw boats fly their spinnakers all the way to the banks before heading back to shore with a tricky beat ending at Sunset House. As the boats headed home the lead changed four times as wind shifts and the off shore currents turned the race into a tactical contest. Onlookers enjoyed an exciting sunset finish as the four leading boats finished the 29mile race within 12 minutes of each other. Having overshot the mark at the Banks to slip into 4th “Cheers” skippered by Pete Bridge, sailed a brilliant windward leg to win the coveted Harbour House Marina trophy. 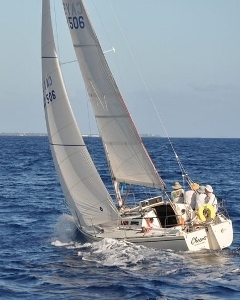 Rob Hutchison’s “Shanti” had led the race for a while but had to make do with second place. Alan Roffey’s “Resolution” just managed to take third place on time. The race back to North Sound on Sunday was a slower affair as boats struggled against the current and light headwinds around North West Point. “Cheers” continued their new found form by winning that race too. (CNS): According to research undertaken by the National Drugs Council, alcohol remains the most commonly reported drug used by adolescents in Cayman. The most recent Cayman Islands Student Drug Use Survey (CISDUS) found that 60.6% (1,775 students) reported having had a drink at least once in their lifetime. From this percentage, 53.6% (951 students) reported that their parents had spoken with them about the importance of not using alcohol, tobacco and other drugs. But only 39.4% said parents had spoken with them about their experiences with alcohol and other drugs when they were young. Offering a list of tips on how to do that, the NDC urged parents to communicate with their kids, provide the basics and listen to them. “As a parent or guardian if you don’t drink, be honest and explain to your child why you have made that choice, including how much fun it can be to be alcohol and drug free,” the NDC stated. 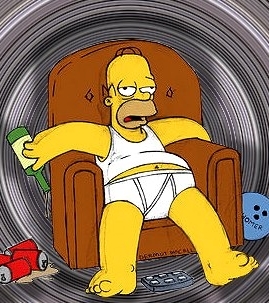 “Almost half of the students that reported lifetime alcohol use, reported that their parents had set an example by not abusing alcohol or drugs. Finally, if you drink, drink responsibly. Let your child see you drink only in moderation, not amounts that produce intoxication. Also give your child the opportunity to see you abstain from drinking and hear you say 'no thanks'. For more information on alcohol and other drugs please contact the NDC by phone at 949-9000, email info@ndc.ky or visit www.ndc.ky. (CNS): More than one hundred people are expected to attend the first ever TEDx event in Cayman next month. 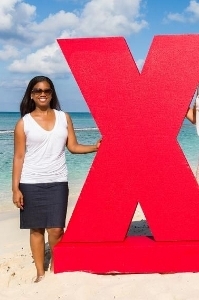 The licensee and organiser, Marzeta Bodden who is bringing the ideas sharing concept to the Cayman Islands said the planned conference will explain TED which is a non-profit organisation devoted to Ideas worth spreading. Throughout the one-day event international and local speakers from various backgrounds and experiences are scheduled to participate including two wild card speakers. Started in California almost 30 years ago TED has grown to support “world-changing ideas with multiple initiatives,” Bodden said. TEDxSevenMileBeach on Thursday April 3 will be sharing ideas here that could have far reaching impacts. “In the spirit of ideas worth spreading, TEDx is a programme of local, self-organised events that bring people together to share a TED-like experience. At a TEDx event, TED Talks video and live speakers combine to spark deep discussion and connection in a small group. These local, self-organised events are branded TEDx, where x = independently organised TED event,” Bodden explained. She added that she has high aims for the event which she hopes will engage the people of the Cayman Islands in a way that has never been done before. “As talks, interactions, and connections occur, attendees and participants will be encouraged to initiate vision, innovate their own paths, and inspire a better world for our collective future. The presenters will share their experience, insights, and ideas with the audience and together, everyone will explore what it means when we all tap into the power of Connecting to Possibility,” she said. A unique feature of the event is the opportunity for unheard voices to join the discussion. TEDxSevenMileBeach is reserving two spaces for local speakers to present their own idea worth spreading. Encouraging prospective TEDx attendees to complete application forms so that organisers may gain a better understanding of the community interested in supporting the ideas presented by speakers. TEDxSevenMileBeach hopes to see anaudience of engaged, enthusiastic, and diverse attendees who are committed to attending the event and are eager to share knowledge beyond the conference itself. TEDxSevenMileBeach, like all TEDx events, is a non-profit event. Companies who believe in bringing together corporations and individuals who want to be change agents surrounding remarkable thinking and ideas are encouraged to invest in the local community to support TEDxSevenMileBeach. Various sponsorship opportunities are available. Several local companies have recognised the value of participation and form the event’s current line-up of sponsors: Tower, Friends of Film, the Cayman National Cultural Foundation, Cayman 27, Regal Theatres and Melissa Wolfe Photography. (CNS): The financial sector has handed over a cheque to organisers of the annual UCCI conference on Caribbean values and ethics which takes place at the University College of the Cayman Islands, later this month. The Cayman Islands Compliance Association is now a gold sponsor at the event designed to raise awareness of the potential for corruption and the decline in ethical standards across all the various sectors of society, and the consequent damaging effect on economies and social harmony. The conference will focus on strategies of various regional governments and organisations, public and private, to raise sensitivity to these threats and how to curb and eliminate them. “We are thrilled to be able to support UCCI in hosting the ethics conference, as it will be of significant relevance to our members,” said President of the Cayman Islands Compliance Association Martin Livingston, noting the alignment of the conference’s goals and those of the Compliance Association. The UCCI conference opens on 19 March with keynote speaker Dr Huguette Labelle, chair of the board of Transparency International, an organization that rates governments and their business sectors on perceptions of ethics and trust. Dr. Labelle will be joined for the three-day conference by regional and local heads of states, ministers of government, directors of anti-corruption agencies, and academicians and representatives of various organisations seeking to raise awareness about the need for transparency. They will be sharing ideas on how corruption can be reduced and eliminated from all sectors of communities across the region. Conference organisers are also holding a number of pre-conference workshops before the main event which opens at 5 pm, on Wednesday, 19 March. The Compliance Association represents a cross section of compliance and risk professionals in the Islands’ financial services industries, including bankers, fiduciaries, administrators, accountants, lawyers, and other consultants. The role of the Compliance Association is to foster greater commitment to and compliance with the Islands’ regulatory and legal framework governing financial services. The Association is also participating in the conference, at which representatives will preside over a lunch plenary on Thursday, 20 March. The topic for discussion will be A Blueprint for the Ethical Functioning of the Financial Services. It is anticipated this will reflect the strict rules governing the financial services of the Cayman Islands, and offer a model for the region to the many persons attending from across the Caribbean. Since the Compliance Association’s founding in 2000, members have engaged in a number of community-related efforts. These include hosting member seminars and training courses, sponsorships in the region of CI$10 to 15,000 annually, as well as a number of annual scholarships granted to Caymanians wishing to progress their careers in compliance and risk management. Other projects sponsored have included a financial services section in the ICCI (International College of the Cayman Islands) library and sponsoring United World Colleges (UWC) candidates. President Martin Livingston also lectures at UCCI (University College of the Cayman Islands) on financial services regulation. To register for the conference, go to UCCIconference.ky and see various flyers below detail the conference events. (CNS): A non-profit association has been created to address a catalogue of issues surrounding youth crime, vulnerability and the problems of young people in jail or with family members in the prison system. Officials from Youth Act say they hope to develop and implement effective prevention programs to address anti-social behaviour and empower children to deal with the social, emotional and at-risk demands placed on them by their peers and society. Youth Act is also advocating for a change in public policy in the penalties and punishment administered young people and a call for restorative justice. The group said it has reviewed all the reports from 1999 to 2011 addressing crime in the Cayman Islands as well as the recommendations of the Crime Reduction Working Group of the National Security Council (2011) and the Institute of Public Administration of Canada (IPAC) which addressed youth crime. From these reports, Youth ACT has identified three programs to implement that address youth crime through education and behavior modification. This started with a Youth Crime Prevention Day, on Friday geared to Years 8 and 10 students, to provide awareness of the causes, consequences and penalties of crime and help provide the knowledge needed to make good decisions. The second is SNAP (Stop Now and Plan) is an award winning Outreach Program developed by the Canadian Development Institute (CDI) that helps children and parents regulate angry feelings by getting them to stop, think, and plan positive alternatives. SNAP a community-based program that targets children aged 6 through 12 with conduct and related behavioural problems, and helps their parents to develop effective parenting skills. The new NGO which working with the educaiton ministry is also keen to see a programme to deal with children in prison and children with incarcerated parents. The Youth ACT Board pointed out that the generational issue of children with parents incarcerated falling into crime and following the path of parents and family members. To find out more visit http://www.youtube.com/channel/UC0a1HZv1r2wmcUUxbmLdYmQ for various videos of the NGOs work. (CNS):With all eyes on the new hospital in East End and the launch of medical tourism, younsters in the Brac are also getting their first taste of a career in the healthcare profession.Sister Islands’ students are gaining valuable experience learning from mentors at the Health Services Authority in the Faith Hospital’s internship programme designed to set Cayman’s future medical students on the right path. Dr Srirangan Velusamy, Director of Sister Islands Health Services said creating an open line of communication between the hospital and students plays an important part in encouraging them to make healthcare a career choice. 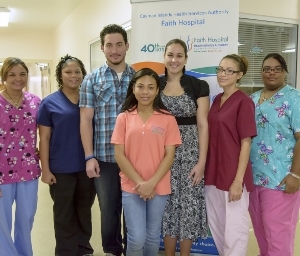 Each year since 2009, Faith Hospital’s intern programme has welcomed two students from Cayman Brac High School’s graduating class to come and learn as much as they can from staff at the hospital. All students who take part in the internship programme face an interview before they begin the mentoring process. The doctor explained that staff mentor students by frequently meeting with them and their parents, guiding students to apply for their university course of choice. It’s an on-going relationship that goes far beyond the year spent at the hospital. Dr Velusamy added that he and his staff would like to see all students who have undertaken Faith Hospital’s internship programme return to the Cayman Islands after their studies and in particular to come back to work at Faith Hospital. (CNS):Two Canadian occupational Therapy (OT) students have completed their eight week fieldwork experience in Cayman. Morgan Hall and Nikki Ross from Dalhousie University in Halifax, Nova Scotia, did the required 1027.5 hours of clinical fieldwork prior to their graduation at the Sunrise Adult Training Centre (SRC).The placements aim to cover different populations, worksites and service delivery models to enable students to become well-rounded practitioners. The ones who maintain high academic performance and show excellent professionalism get the chance to go overseas. Philip Knowles, the OT Therapist at Sunrise is the Fieldwork Preceptor with responsibility for supervising the students while they complete client assessments, develop programme activities for the OT Room, and run a Boundaries Group for two client groups. Director of Sunrise Shari Smith explained this was the first time that Sunrise has hosted such a fieldwork partnership, and it is also a first for the Ministry in the area of OT. Hall and Ross said they thoroughly enjoyed their time at Sunrise and in Cayman. While Ross echoed her colleague’s sentiments saying her time at the Sunrise Adult Training Centre was wonderful with staff and clients being so welcoming. “I have really enjoyed learning about occupational therapy in an emerging practice setting and having the opportunity to explore the Cayman Islands," she added. Hall and Ross are also shadowed other OTs within the Department of Education, at Lighthouse School and in the Early Intervention Programme. Kimberly Voaden, Programme Manager at Sunrise and an OT who trained at a Canadian University explained the importance of fieldwork for an OT. “As a former graduate of a Canadian Occupational Therapy university programme, I know how valuable fieldwork placements are for cementing classroom theory, providing essential hands-on practice with clients of all ages, and improving communication and clinical reasoning skills. Because Occupational Therapy is such a broad profession, fieldwork placements can be definitive in helping an OT student choose the area(s) in which they eventually want to focus their professional practice.